It’s the crown jewel in one of the biggest hotbeds in the world for the beautiful game, but, the 2016 iteration of the Copa America may go down as one of the biggest sports busts in recent memory. For the first time, and you’d have to figure, maybe the last, the Copa will be played in the United States, across ten cities. The games will be played in some of the biggest stadiums in America, whether it’s Soldier Field in Chicago, the Rose Bowl in Pasadena or Levi’s Stadium in San Francisco – and if ticket sales are any indication – the majority of venues will be half empty. Let’s start with who’s playing, and, there’s no shortage of names or quality – headlined by the number one ranked team in the world, Argentina, led by one of the most recognizable names in the sport – Messi. Furthermore, he’s committed to playing the tournament – anyone familiar with how these things go, many a star pull up with injury or bow out of certain tournaments early – something Neymar, of Brazil did after this tournament was announced. The sad part is that Messi may end up missing some minutes, or even a game, as he’s picked up a knock in a recent friendly. Argentina still has names like Sergio Aguero, Angel Di Maria, and Higuain, superstars in their own right. While Brazil lacks Neymar – they still have Kaka, Willian, Dani Alves, and Hulk. Brazil, while most recognizable to most casual soccer fans, rank lower than two other teams participating, Chile (ranked 3rd) and Columbia (ranked 4th). Uruguay is the other team in the top ten that will be participating. The other teams? Host USA, Bolivia, Costa Rica, Ecuador, Haiti, Jamaica, Mexico, Panama, Paraguay, Peru, and Venezuela. Anyone who knows their soccer, knows that to be able to see half of these teams play in a competitive match, in a tournament they truly care about would be a check mark on the old bucket list. In most cases, it would cost hundreds of dollars for a ticket – but, because of the way this event has been marketed and scheduled – you can see some of the greatest that play the game for less than a cup of coffee. Let’s focus on Seattle, as that’s the closest to our market, and is the most relatable. The Sounders regularly sell out Century Link Field in the MLS, no simple feat considering there’s 38,000 seats, they sell the whole thing out for five matches a season (42k+), so give the Pacific Northwest the opportunity to watch Lionel Messi and Argentina run rampant against Bolivia, and be thankful there’s no roof to be blown off right? Wrong. Apparently, the Pacific Northwest would rather see Erik Friberg over Lionel Messi. Go figure. You’d think Portland Timbers fans would be trekking up the I5 – but that’s a no go either. 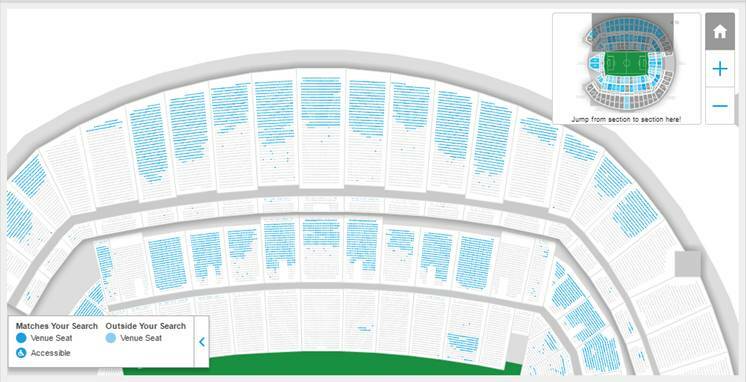 This seating chart is directly from Ticketmaster, and is for the Argentina/Bolivia match and every blue dot represents an empty seat, to say that ticket sales are slow is being incredibly generous. Taking a look below, it’s not just premium seats that are available, it’s the ‘cheap seats’ as well – the seats starting at $50. So, how did we get here? How did one of the premier tournaments in the sport receive such a lukewarm response in not just Seattle (seating charts aren’t much different across the other nine cities)? How is Argentina’s only game in Seattle not even close to being half full? The answer, as always, is complicated. The folks behind the ticket sales process, initially rolled out a venue pass program – where attendees were encouraged to purchase tickets for all games played at a specific venue – those tickets started at over $200USD. Now, $200 for three matches, where you have the chance to see some world class talent isn’t bad, ticket sales went on sale before groups were announced, and so a number of people (myself included) purchased tickets before even knowing who was playing where – Seattle, got the worst draw, with its first game, this Saturday, when Haiti takes on Peru. Those tickets are starting at $6 on the secondary market, the official seating chart for that game looks like a sea of blue – even more than this one. Individual games didn’t go on sale until recently, and, by then the price gouge of only selling venue passes – likely soured many a fan. The casual fan would want to attend one of these games with their family, and the tournament has a strict ticket policy, where every single person entering a stadium requires a ticket – regardless of age. That rules out a lot of families early on – kills a lot of buzz that tournaments like this generate, as word of mouth starts to get people excited. You may be thinking it’s unfair to look at Seattle’s situation, despite it being one of most successful cities for the MLS, but, it’s a similar story across all venues. Levi’s Stadium might be one of the better attended venues, but, even there, you could get tickets for Uruguay and Jamaica starting at $6 on the secondary market – and that was before Luis Suarez got injured. Half of the people in the stadium probably don’t even know who Luis Suarez is – which is the other problem. People still don’t understand and recognize the big names as much as organizers would like them to. There’s plenty of supporter groups throughout North America – but, many are fans like those of TFC – that cried foul when their star player, Giovinco, wasn’t selected to the Italian squad for the Euro. Not understanding or caring about the pool of Italian talent. Many are soccer ‘elitists’, but don’t fully appreciate the global game. Why not cater to those groups by offering affordable ticket options? To many a casual spectator, the Copa is akin to the exhibition matches that Premier League teams come over to play, and while those give you a chance to see a few stars – they wouldn’t be anywhere close to competitive. Instead the organizers chose to play a very expensive game of chicken, and lost, unless of course, Team USA captures the countries imagination and gets on a bit of a run, which again judging by the talent on display here, is unlikely. The other contributing factor here is marketing – there’s been little to no presence or awareness across the border that a selection of superstars is showing up at a stadium just a couple of hours away. Ticket offers were extended to MLS club email lists, but, again, only venue passes were available. You’ve got to wonder if that more of a sustained campaign and more partnerships were struck up, including with those supporter groups – would it have translated to more success? To give you some perspective, the Canada men’s soccer team sold out BC Place for their match against Mexico here a couple of months ago. That was largely driven by supporters group, and a sudden burst of national pride. Chicharito, the star of the Mexican squad, wasn’t the driving force for that one. It’s a big risk to take for any tournament, to offer only premium tickets, rely on a tournaments hometown reputation, and the knowledge and hunger of a growing market – some would argue it was a well calculated risk, but a few days before it kicks off, there’s no denying that it’s risk that has seriously backfired. Empty stadiums won’t make for lively atmosphere, good television or happy sponsors – and ultimately, you’d have to imagine would hurt the United States chances at hosting another Copa America tournament, let alone, a World Cup.